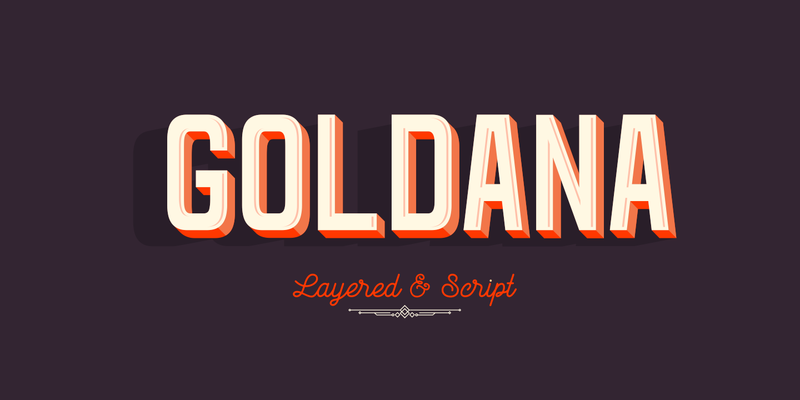 Goldana is a display layered typeface created by Cucu Supriyadi and published by Seventh Imperium which is available in 24 styles, a wide range of Opentype features and multilingual support. Base leyer is regular, several styles can be mixed, several can be use alone and some can be layered, all for you to play. Can create dimensional look, vintage feels, art deco style etc. Cannot miss it! Styles: Base, Dot, Drop Shadow, Drop Stripes, Emboss, Inline, Outline, Outline Extrude, Script, Script Shadow, Shadow, Stencil, Stripes, Dor Solo, Drop Shadow Solo, Emboss Solo, Inline Solo, Shadow Solo, Script Shadow Solo, Extrude, Extrude Detail, Extrude Shadow, Extra. Price: starting from $10 for one font to only $80,00 for all 24 fonts. A font description published on Wednesday, April 19th, 2017 in Cucu Supriyadi, Fonts, Seventh Imperium by Alexandra that has 3,953 views.